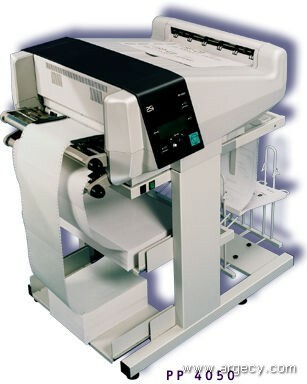 The wide-format laser printer PP 4050 based on LED-electrophotographic technology reflects a unique combination of capabilities. The printer performs 34 pages per minute and is designed for a heavy duty cycle of 200,000 pages per month. With its ability to print two different fanfold forms up to 17 inch wide and the intelligent Paper Stacker the PP 4050XP fulfills distributed printing applications. The PP 4050 has been successfully introduced to the U.S. and Asia market. By means of exchangeable interface modules the PSi printers can be easily integrated into major host systems and network environments for business and industrial applications.